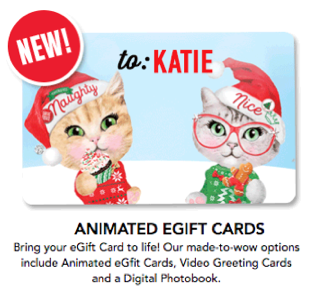 GCI research leads to new fun and interactive Gift Card options that improve the #1 most requested gift. One thing is for sure, Gift Cards are basically a piece of plastic, often given at the last minute. While certainly the most requested gift item on holiday lists, it is also the most impersonal gift, according to research conducted by Gift Card Impressions™, a leading researcher in the large, $150B Gift Card Industry. However, with all of the new mobile technologies, comes new fun and interactive Gift Cards that look very different from that piece of plastic lost somewhere in a kitchen drawer. 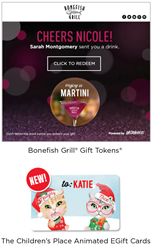 So, this holiday season, it may be time to ditch the plastic and try one of these fun new ways to send a Gift Card. GCI, is a gift card industry leader providing engagement and gifting solutions to leading retailers, Gift Card brands and leading corporations. The company has received 29 industry awards for innovation in the last 5 years and has more than 98 patents issued with another 30+ patents pending in the US and worldwide. For patent information, see gcipatents.com. The company’s leading-edge research allows the company to understand how to provide revolutionary communication and gifting solutions that enhance engagement and create more meaningful and shareable experiences for consumers and businesses.